Care2 Causes | Is Going Gluten-Free The Right Choice For You? Is Going Gluten-Free The Right Choice For You? Following a gluten-free diet is all the rage these days, especially among American consumers: USA Today reports that up to one in four people in the US seek out gluten-free foods. You can find gluten-free foods at almost every grocery store these days, but what exactly does this diet consist of, and why has it become so popular? As with all fads, I am suspicious of their real benefits, and so decided to find out. Gluten is a protein found in grains such as wheat, barley and rye, which means that it is present in some of my favorite foods, including bread, cakes and pasta. You know that chewy texture of bread, and the way it rises? You can thank gluten for that. But bread and cereals are not the only places where you’ll find gluten; sauces, salad dressings and soups also contain gluten, where it may be used to thicken the consistency of the liquid. And for some people, the presence of gluten causes serious health problems. The primary reason for developing a gluten-free lifestyle is an illness called celiac disease. This occurs when people have an intolerance to gluten. Symptoms include chronic diarrhea, weight loss, and fatigue. It is caused by a reaction to a gluten protein called gliadin, which is found in wheat, barley, rye, and occasionally oats. An allergy to wheat can also result in symptoms such as hives, difficulty breathing, and digestive problems. Furthermore, people with celiac disease have problems receiving the proper nutrients from gluten-induced foods and therefore are not receive sufficient nutrients to feed their bodies. The only treatment for celiac disease is a gluten-free diet. Gluten intolerance is very common — between 5 and 10 percent of all people suffer from the disease and it affects one in 100 people, totaling to nearly three million Americans. Obviously this is a serious disease, and sufferers need to take drastic measures. But according to USA Today, even though doctors estimate that only a small percentage of the US population has celiac disease, the demand for gluten-free products is coming from 15-25 percent of American consumers. So why is one fourth of the population of the US purchasing gluten-free beer and cookies when they don’t need to? Such celebrities as Oprah Winfrey have contributed to this fad: her 21-day cleanse last summer included no meat, no dairy, no sugar, no caffeine and no gluten. There are some sound health benefits to adopting a gluten-free diet, like improved cholesterol levels and better digestive health. One reason is that gluten is present in a lot of fast and processed foods, so by eating gluten-free, you are probably consuming mainly organic products and a lot of fruit and vegetables. Gluten-free foods also contain antioxidants that help sustain the body. On the downside, however, a gluten-free diet is not necessarily the healthiest diet to follow. An opinion piece in the BMJ this week warns people against self-diagnosing with gluten sensitivity – for which there is no definitive diagnostic test. 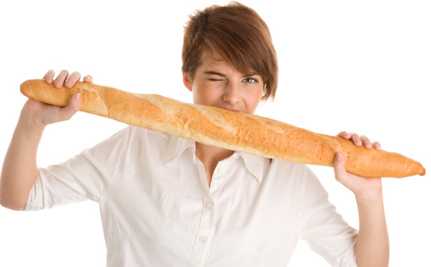 A person may actually have the more serious coeliac disease or they may falsely attribute their symptoms to gluten. A sensitivity to gluten is a diagnosis of exclusion – you should have tests to make sure it is nothing more serious. In short, if you have symptoms that could suggest gluten sensitivity you should see your doctor. * There is no evidence that such a diet reduces ADHD or helps you lose weight. * Gluten-free foods may have more sugar and fat in them to make them palatable. * Gluten avoiders may also end up short on vitamins. * Some gluten-free foods can be very expensive. * Just because it’s the latest fad, you don’t have to go gluten-free. If you believe you have an intolerance to gluten, go to a doctor to get expert advice. If you check out negative, following a balanced, healthy diet is a much better option than going all-out for the gluten-free option. Can “Gluten-Free” Food Be Trusted? Can A Gluten-Free, Casein-Free, Diet Help Autistic Kids? Since when is an opinion piece from a newspaper a credible source? Gluten free is not a "fad" - it makes historic and scientific sense if people do some research. No, because I'm not gluten intolerant and I don't want to risk my incredible health for a fad. And it IS a fad for people who haven't been diagnosed with gluten disorders by a qualified physician. The medical establishment is only starting to understand gluten intolerances and many doctors still don't understand that just because you don't have celiac, doesn't necessarily mean you aren't still reacting to the same family of foods. New research finds that many people improve on a gluten-free diet, not because they react to the gluten, but to fructan which wheat, barley, rye are also high in. Gluten-free diets can be short on fiber if you just replace bread products with their gluten-free equivalents (often made from rice flour) and they are also short on a lot of the foods that are normally fortified. Not to mention that whole grains that contain gluten are also good prebiotics and are lower in calories than their gluten-free alternatives. That said, gluten is not a requirement in a human being's diet. If you eat a healthy diet with plenty of variety, you shouldn't be short on any nutrients. The Japanese don't eat much bread and they live longer than anyone else on the planet. If you don't need a GF diet, it is difficult enough to stay 100% GF that most people simply won't do it. And if you do react to the gluten in foods, your symptoms are likely to be bad enough to never want to ingest gluten again. But for anyone who just thinks that dropping in and out of eating GF is going to see some benefits, think again. Gluten is addictive, an opiod peptide, and there are withdrawal symptoms every time you go but don't stay GF. Gluten is ok for me, so I'll keep eating it. wonder where the "gluten is more natural food for humans than meat" people are. or do they not comment on topics like this? when people are allergic to eggs and milk, they say "it is proof we are not meant to eat it" when people are allergic to gluten and wheat, dosen't that say "we're not meant to eat it" as well?